Cities within the developing world experience a form of urban development which is different to those in more industrialised countries. Rates of growth are usually much more dramatic, housing and transport are often provided informally, and institutional support for urban management is also much weaker. 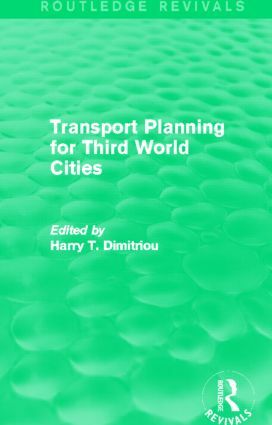 The crux of this book, first published in 1990, lies in the idea that urban transport planning cannot be viewed in isolation from this wider development context. Making special reference to a number of countries, including Brazil, India and Indonesia, chapters discuss problems of urban transport planning, deficiencies in the theory and practice of conventional transport planning, and the emerging alternatives in the countries under examination. This work addresses problems that are still of great concern to urban policy planners, professionals and academics, as well as students from the fields of development studies, urban geography and planning, architecture and civil engineering.